Having visited the beauty and ancient history of the Persian civilization, the great Iran has more to offer in its arts and handicrafts industry, as memorable and exciting as all those historical monuments. Due to the very old civilization, rich culture and geographical location, Iran plays an important role in the world of arts and crafts. Encountering with abundant fascinating souvenirs, tourists are hard not to indulge themselves. Having high quality but at a budget price, these unique artistic works are mainly found in the city bazaars which are usually the best places to start looking for. In the major cities of Isfahan, Tabriz and Shiraz where more foreign tourists visit, the commodities are more inviting and attracting. Every part of Iran is specialized for certain products which knowing them is essential for getting a good price. Distinguished in various fields including weaving, architecture, painting, pottery, calligraphy, metalworking and stone masonry, Iran is home to one of the richest art heritages and handicrafts in world history. 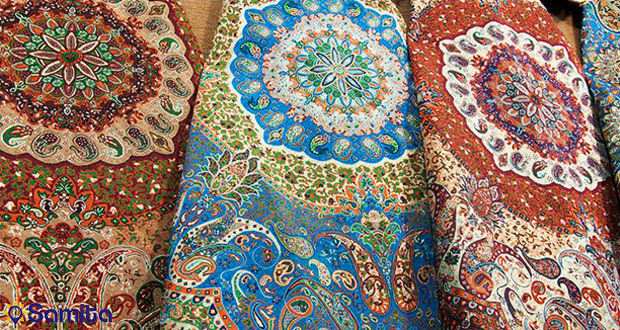 A brief description on some of the most popular ones is as follows: Iranian Carpets and Rugs Dating back to 2,500 years, the art of carpet weaving is rooted in the culture and customs of Iranian people and includes amazing mixed patterns similar to the Persian garden: full of florae, birds and beasts with a myriad of colors extracted from wild flowers. Iranian carpet is traditionally handmade from natural materials in the span of several months. Depending on where the rug is made, patterns and designs differentiate with some variations in textures and number of knots in rugs such as Gabbeh, and Kilim. Iranian carpet weavers produce the largest amount of hand-woven carpets across the world; the most wonderful ones in terms of design and color compared to other similar products. 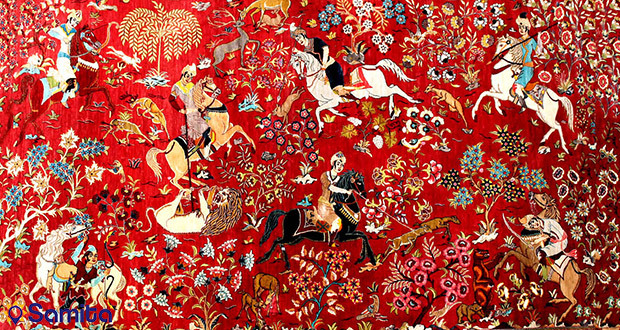 Marquetry Since the Safavid period, delicate and meticulous marquetry (Khatamkari) has enjoyed a great popularity. Incrustation craft consists of producing coating patterns (generally star shaped) with thin sticks of wood (ebony, teak, orange, rose), brass (for golden parts) and camel bones (for white parts). Many objects can be decorated with marquetry such as jewelry/decorative boxes, chessboards, pipes, desks, frames or some musical instruments. Incrustation (Khatam) can also be used in Persian miniatures, making it a more attractive art work. This craft is still practiced and mostly found in the historical city of Isfahan. 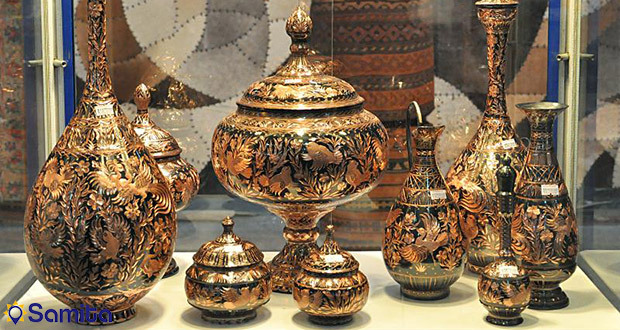 Enamel Working Having abundant use in producing metal and hygienic dishes, enamel working (Minakari) and the art of decorating metals with colorful and baked coats is an adorable artwork in Isfahan, drawing high attention by painters, goldsmiths and metal engravers for a long time. The artwork is categorized worldwide as follows: enamel painting, chess-like enamel and cavity enamel. 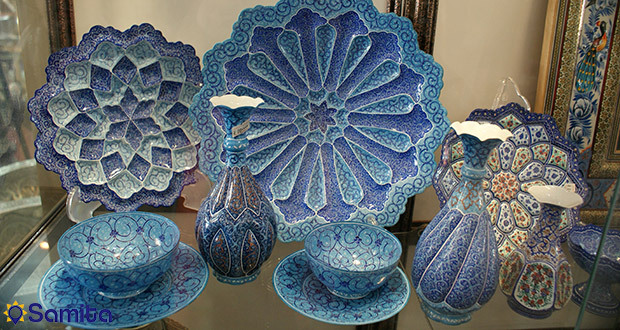 The existence of outstanding enameled dishes and materials dates back to the Seljuk, Safavid and Zand dynasties as shown by historical documents. Most of the enameled dishes related to the past belong to the Qajar dynasty during 1810–90. Bangles, boxes, water-pipe heads, vases and golden dishes with beautiful paintings in blue and green colors remain from that time. This art was fostered in terms of quantity and quality by Master Shokrollah Saniezadeh, the outstanding painter of Isfahan, for 40 years. Tilework Inspired by ancestral nomad tribes with geometrical motifs used in kilims or gabbehs and influenced by Islam with an advanced geometrical studies, particular patterns in tilework were emerged to decorate Iranian crafts. The blue mosques of Isfahan were adorned by tilework as a unique feature. The art origin dates back to old centuries; the cities which used to be the hub of Iranian mosaic and tile industry were Kashan and Tabriz. 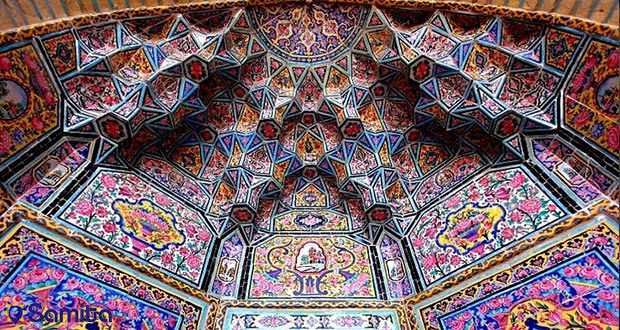 Architecture Constituting a nice and ancient Persian tradition, Iranian architecture is magnificent and impressive, displaying a wide variety of aesthetical structures. Overcoming the repetitive invasions and cultural shocks, it has achieved distinctive virtues, unique compared to that of other Muslim countries such as amazing decorative styles and structural ingenuity in constructing vault and dome. Also, the traditional style of Persian gardens has had a meaningful impact on the design of gardens from Andalusia to India and beyond. Remained from the era of the Mughal Empire, Taj Mahal in Agra, India is widely recognized as "the jewel of Muslim art in India" in terms of architecture and Persian-style garden layout called Chahar Bagh: the quadrilateral garden divided by walkways or pools into four smaller parts. Literature To express Iranian genius, the Persian literature is by far the most outstanding instance. In spite of masterpieces in prose, the real spot where the Iranian literature shines is poetry which has flourished for a period of more than a millennium as it has been praised and admired far beyond the limits of Iran by so many worldwide scholars and litterateurs. It is to an extent that affected on the development of Turkish and Indian literatures. Ferdowsi, Khayyam, Hafez, Sa’di, Rumi, Attar, Nezami, Sanai, Roudaki, Jami and Shahriar are among the most notable Iranian poets. Calligraphy Initiated by Darvish and emulated by his counterparts in later periods, Persian calligraphy is believed to be a kind of creativity in handwriting which includes different styles. Its popularity is in a way that the calligraphic adorning is a significant part of pottery works, metalwork and historical buildings. Having been written by delicate calligraphy, there are highly valuable illuminations especially in the holy Qur’an and works such as Shahnameh, Divan-e Hafez, Golestan and Boustan, most of which are preserved in museums and private collections worldwide. Painting and Miniature Having a long antiquity which dates back to 5000 years ago when imagery of animals and hunting scenes exhibited on the walls of caves, the art of painting in Iran is a unique craft as oriental historian Basil Gray believes “it is excellent in its kind”. As Master Kamaleddin Behzad invented a new style of painting during the Tamerlane era, the art reached its peak and then European styles and Safavid miniature were envisioned in Qajari paintings, introduced by Reza Abbasi, and pushed forward by masters including Kamal-ol-Molk and Mahmoud Farshchian up to now whose paintings are world-famous. Likewise, “teahouse painting” was emerged with religious and literary themes during the Qajar era as a true instance of the art. Relief Carving, Pottery and Others Relief carving and sculpture with a rich history as old as the Elamites and the Achaemenid Empire with Persepolis as a hub of amazing relief creations as well as exceptional pottery, earthenware and vessels found in the historical ruins of Iran particularly in Sialk and Jiroft sites together with engraving dating back to the end of the second millennium BCE are among other Persian art fields. Also, Galesh (Traditional Footwear), Qalamkar (Persian Block-Printing), Giveh (Handwoven Shoes), Termeh (Handwoven Silk and Wool Fabric), and Persian jewels are of other fantastic Iranian handicrafts.